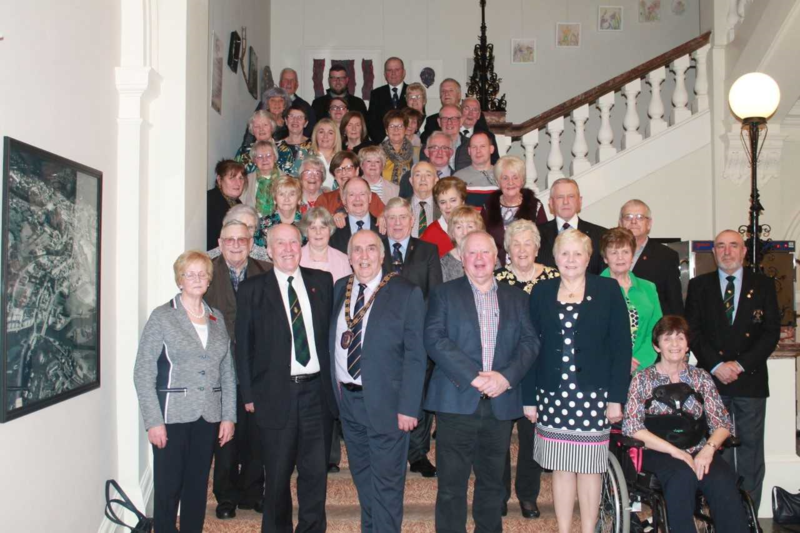 A reception was held for members of the Enniskillen and Irvinestown branches of the Royal British Legion and Poppy Appeal at the Townhall, Enniskillen, hosted by the Chairman of Fermanagh and Omagh District Council, Councillor Howard Thornton. 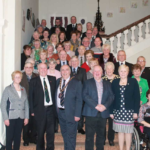 Speaking at the reception, which took place on 20 March 2019, Councillor Thornton said, “As Chairman of Fermanagh and Omagh District Council, I am delighted to welcome you all to the Townhall this evening. I would like to extend a particularly warm welcome to our guests of honour, Members of the Royal British Legion and Poppy Appeal Collectors from Enniskillen and Irvinestown in whose honour this evening’s reception is being held. You are all most welcome. Both Enniskillen and Irvinestown have a long association with the Royal British Legion and Poppy Appeal Collections. If I turn firstly to Enniskillen, I know Enniskillen has a very dedicated team of some 52 Poppy Collectors some of whom have given of their time for some 44 years – such dedication and selflessness is to be admired and applauded and I would like to particularly commend Mrs Joan Cathcart, Mrs Vivienne Ferguson, Mr Denis Gault, Mrs Sylvia Wood and Mrs Dorothy Scott all of whom have clocked up 44 years of collecting for the Poppy Appeal in Enniskillen. It is also encouraging to know there are newer members who have come onboard in the last few years to help sustain the Poppy Appeal into the future. However, I also recognise that none of this happens without good organisation and leadership and in Enniskillen I know this is ably provided by Ruby Elliott who has been the Poppy Appeal Organiser since September 2015 and she has been ably assisted since 2017 by Mr Billy Dixon – so I thank them both for their commitment and dedication to this very worthy cause. In the last four years alone, some £124,000 has been collected through the Poppy Appeal in Enniskillen – congratulations on such an achievement. Turning now to Irvinestown, the Irvinestown Royal British Legion branch has been going from strength to strength since its formation on 10 January 1947. Irvinestown branch was the 90th Royal British Legion Branch to be formed in Northern Ireland and its first Chairman was Captain WR Shult MC – today the branch is ably chaired by Mr William Irvine, with some 102 members. Over the years the branch has had a few homes – in 1947 the branch met in Castle Irvine Primary School from where it moved to its own hall in 1948 and where it continued to meet until the building was sold to the Ministry of Defence in 1971 for the princely sum of £75. Meetings then continued in Mahon’s Hotel for awhile before moving to the Necarne Arms where it still meets monthly. The branch also supports the Poppy Sellers, not all of whom are members of the Legion and I know Irene Kerrigan, Poppy Appeal Organiser is very grateful to all the Sellers who provide of their time. I am delighted that the Royal British Legion remains a vibrant organisation and it is commendable the work the Legion undertakes to support the annual Poppy Appeal. I note the exceptional efforts of both Enniskillen and Irvinestown who have raised significant funds through the annual Poppy Appeals. I congratulate every single person involved in this worthy cause, all of whom give of their own time in all weathers to raise these funds. I know that often the work of the Royal British Legion goes unnoticed or reported due to confidentiality, but I am fully aware of the diligent and caring work that goes on in the background and I commend you all for this tremendous contribution to your community. Like so many of other worthy causes, the Royal British Legion and the Poppy Appeal exists because of the efforts of so many like yourselves here this evening who willingly give of your time in the interest of others and so it gives me great pleasure to acknowledge in a small way through this Reception this evening your commitment and dedication to such a wonderful organisation and to the ongoing annual Poppy Appeals.